It’s hard to believe, but the Internet used to be weirder. Not weird in the way it is now, where white supremacists rally around cartoon frogs and you can get fired for an errant comment on Twitter, more weird in an uncanny way. Weird in that we all made our own web pages more or less for ourselves and played Flash games on the websites of fast food joints. Weird in that the grammar of the web hadn’t yet been established, so auto-playing music and wall-to-wall low-res gifs were enough to build a whole site around. Hypnospace Outlaw, now in beta, takes the weirdness of that era and filters it through a layer of dream logic to create a surreal yet strangely familiar version of the web. The beta is light on content, but what it shows is promising both as a game and as some kind of digital installation art. The gameplay is fairly simple. 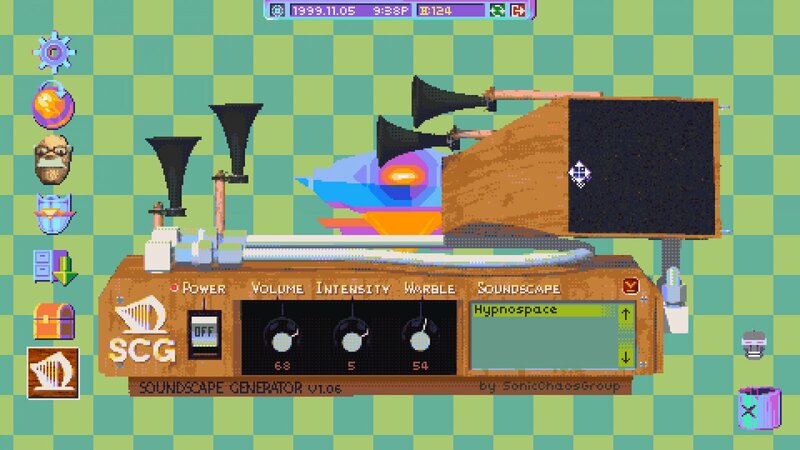 Using an in-game web browser, you patrol Hypnospace, a version of the internet accessible through dreams, sniffing out cyber crimes such as copyright infringement and harassment. When you find evidence of wrongdoing, you stamp it with the correct offense and collect a small payment of Hypnocoin. The beta gives some sense of the lengths you’ll have to go to put a stop to unlicensed jpegs of cartoon characters and screen-hijacking viruses. While somes sites are listed in “zones,” equivalents of web rings and link aggregators, others are unlisted, meaning you can only find them by searching for keywords. You’ll have to piece together clues and cryptic references found on legitimate sites to navigate through this seedy digital underbelly. Tracking down these violations — which seem almost charmingly low-stakes given the kind of behavior that’s become the norm in the real world — is satisfying enough on its own, but it’s the game’s presentation that really shines. Hyperspace Outlaw essentially turns your computer into an emulator for HypnOS, the game’s oneiric operating system. When you boot it up, you’re given a view of a stylized desktop complete with a low-res UI, trailing mouse cursor, and lo-fi system sounds. If you poke around, you’ll find screensavers and other archaic software that perfectly encapsulates home computing in the ‘90s. Naturally, this alternate reality nostalgia trip finds its best expression in Hypnospace, the titular dream-powered internet. For the most part, it nails the tone of the internet in the ‘90s, from naive pages of bad poetry and directionless teenage angst to sites that seem to have been made manifest by sheer boredom rather than their creators having anything to say. You’ll also find plenty of ways to spend your hard-earned Hypnocoin on wallpaper and pointless virtual pets for your desktop. The beta also includes tools that allow you to make your own web pages and music in the game’s quirky, dreamlike style. It’s hard to say what Hypnospace Outlaw will offer to folks who weren’t online during the internet’s infancy. I found it utterly charming and I would be happy to flush hours down the drain just surfing its off-kilter version of the early web. While playing the role of an internet detective is interesting, most of the joy I got out of it was from simply inhabiting the unique ecosystem that it presents. The full game promises a more coherent plot as one of its improvements from the beta, but I’m most interested in seeing how it populates its digital dreamscape. I’d be perfectly happy to see the actual gameplay take a back seat to simulation as long as the world is full enough. It also remains to be seen how long that spell will last when it’s a fully realized game rather than a roughly one-hour beta, but I’m looking forward to spending more time with the game when it launches later this year.